You will get to see the maiko dance a dance she practices every day. You can take photos and video of her, but be careful not to obstruct other people’s view of the dance. It’s really rare to get to a take a picture with a maiko, and this close! But be careful not to touch the kimono of the maiko; it’s very expensive! You not only get to see a maiko, but you also get to eat a full course Japanese dinner and drink beer and sake too. The full course contains an appetizer plate, sashimi, Japanese-style steak, chawanmushi (an egg custard dish), noodle dish, and a dessert. The maiko is underage so she cannot drink alcohol, but she can pour some beer for you! When interacting with the maiko, please remember your manners. This is an experience you won't regret. Getting to really talk to a maiko would already be almost unthinkable, but to think that you also get to play games with her... it's almost too much. And the food is rather good too, and you even get to drink as much beer as you want. 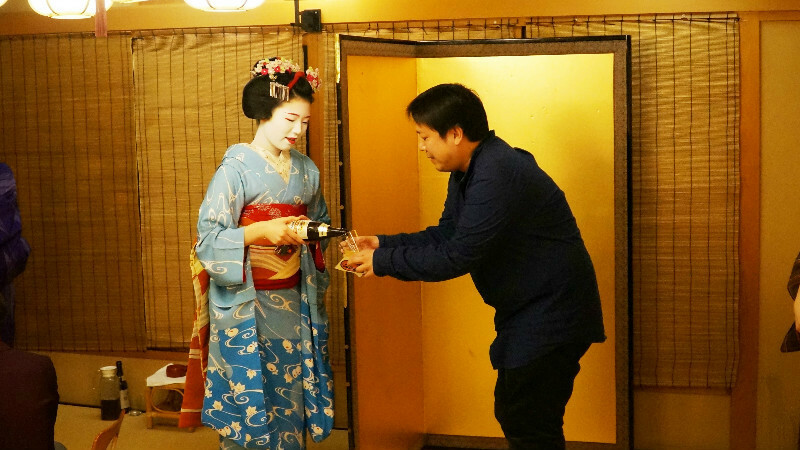 Though as you're with a maiko, remember to have a glass of sake too. A 10-minute walk from Keihan Gion-Shijo Station. Main tour: Every week on Tuesdays , Thursdays, and Sundays, 6 p.m.-8 p.m. The VIP Tour takes place between 11 a.m. and 8 p.m. and you can decide the time for it. The tour takes two hours and can be reserved for any day. Accepted. Main tour: Reservations accepted until 3 p.m. on the day. VIP Tour: Reservations need to be done at least three days in advance. No open every day the event is scheduled to happen. Getting to see a maiko is not a casual affair, so please dress accordingly. This doesn’t mean that you have to dress formally, but please don’t go to see the maiko in shorts and sandals. The seating is in Japanese style tatami so please remember to wear socks. VISA, MASTER, AMEX / Accepted. There is always an interpreter present to help you communicate with the maiko, and the staff understands English so you shouldn’t have anything to worry about here.